You just can't force people to find things magical no matter how much money or effects you throw at them. You can't force whimsy, but Pan did its absolute best to try and convince everyone how wonderful, how magical, how fantastical it all is. 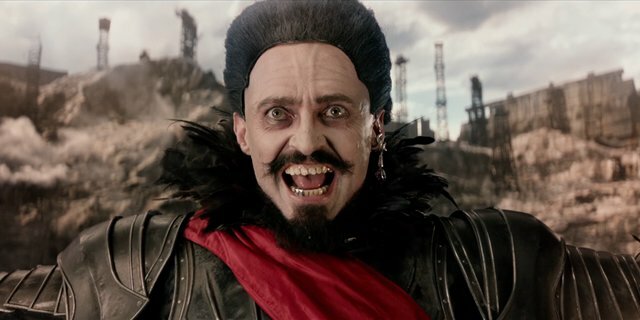 Billed as a family film about the origins of The Boy Who Never Grew Up, Pan ends up being almost a horror film about the shameless overproduction of visuals at the expense of just about everything and a cautionary tale of what happens when you craft a film to try and force-feed audiences instead of giving them something worth their time. London: The Blitz. 12-year-old orphan Peter (Levi Miller) is in a place that makes the orphanage from Oliver! look like Willy Wonka's factory. The nuns are cruel beyond measure, down to hoarding food for themselves. Peter is also troubled by the disappearances of other orphans, but he can't make sense out of it. That is, until we learn that the nuns are in cahoots with pirates with flying ships that kidnap the children. In their latest raid, among those taken is Peter. Once in Neverland (where for reasons the script never makes clear, the ship and new arrivals are greeted to Nirvana's Smells Like Teen Spirit), they find that they are all at the mercy of Captain Blackbeard (Hugh Jackman). He uses the children as miners to locate pixium, the rare material that usually comes from pixies but which Blackbeard hunted to near or total extinction. Pixium keeps him looking young, so obviously the idea of an old Wolverine is unspeakable. One day on the job and Peter manages to find some...and promptly accused of trying to steal it. Blackbeard has only one punishment for this: he has to walk the plank and fall to his death to The Ramone's Blitzkrieg Bop (again, for reasons no one knows). Surprising all, Peter manages to fly! This alarms Blackbeard, as he knows of a prophesy involving a flying boy. At this point, it's a bit muddled exactly what the prophesy says, since I understood to mean that the flying boy was the product of a fairy prince and a mortal woman, but for most of Pan his mother is a fairy and his father I think was also fairy...I think. Well, Peter makes his escape, with a little help from another miner, an adventurous fellow named James Hook (Garrett Hedlund). They make their daring escape and as much as Hook wants out of all this, Peter is adamant about finding the truth of his mother. This means searching for the Fairy Kingdom, which I think is protected by the Indians, among them the Princess Tiger Lily (Rooney Mara, about as Native American as Elizabeth Warren, but that's neither here nor there). Blackbeard goes after them because he wants to kill the boy who is prophesied to kill him, and it helps that Blackbeard already killed Pan's mother. They do find the Fairy Kingdom, James Hook and Tiger Lily join Peter in doing battle with Blackbeard, and Peter at last has full confidence in his ability to fly by leading the fairies to do battle. We end with now-Captain Hook going back to get the other orphans to join Peter as the Lost Boys. 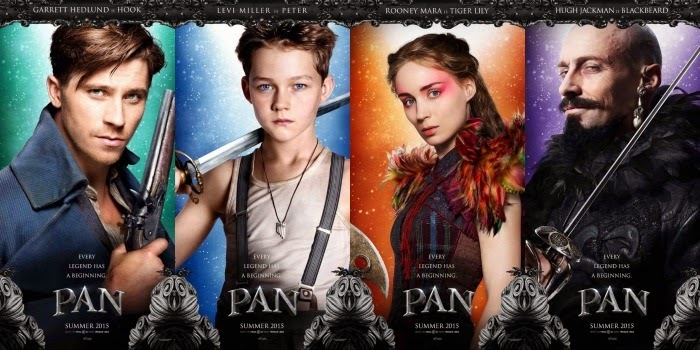 Pan just is a disaster, though through no fault of its lead. Levi Miller, who is making his film debut with this production, and it is such a shame that he landed in this turkey. He does a remarkable job as the wide-eyed Peter who rises to become the hero he is 'destined' to be. He has the hallmarks of a good young actor, conveying rage, hurt, sadness, fear, and wonder with total conviction. Everyone else though is off on another world, with each other lead apparently in another movie of their own imagination. Hedlund, I figure, might be having fun with Pan serving as a nearly two-hour audition tape for the Han Solo prequel. He was off doing a Harrison Ford impersonation, switching from Han Solo to Indiana Jones and either wildly overacting or deciding it wasn't worth the time even trying to make anything regarding Pan rational. The fact that we got 'children forced to work in mines' and a ship's captain who comes in to help the hero at the last moment as parts of Jason Fuch's jumbled and chaotic script does not help in the Indiana Jones/Han Solo comparisons. Nothing, however, can prepare you for the clearly insane...thing that Jackman was doing. Was it some avant-garde theatrical style? Was it him thinking, "oh, it's for children, so I can go so over-the-top they can see my performance all the way to the second star on the right"? Was it a cash-grab? If HE or ANYONE can explain why Smells Like Teen Spirit or Blitzkrieg Bop had to be sung in Neverland (or how they came to be known at least thirty years before they debuted) or why Blackbeard was even here to provide a rather dull antagonist, please feel free to drop a note. Mara was, well, I'm not sure what she was...apart from not being Native American. There were more problems than just the performances save Miller (and that's saying an awful lot). As I stated, there was no story, origin or otherwise. Sometimes, at least at the parts I was conscious in (since I did nod off...it's almost impossible not to at Pan), one wasn't sure what was not so much going on but why anyone would care. So, Blackbeard killed Peter's mother, so he knew who Peter was...yet he didn't bother to, like, kill him when he arrived (too busy doing a drag queen impersonation and singing along to Nirvana I guess). Everything was so frenetic, so rushed, so convoluted, so chaotic, so tossed wither-and-yon that it soon overwhelms you in a bad way. You don't care what is going on because you don't care what happens to those people, that is, if you can actually follow what is going on if you're still awake. Pan drowns in its visuals, which sometimes are pretty (the Mermaid Lagoon sequence being nice), but when it actually has nods to the future (Hook quickly pulls his hands out of the water when told they are infected with alligators), it won't take advantage of what could be a good set-up. Would it have killed Pan to come up with the story of how Hook got his hook? Pan could have been something good. Pan, with a little more thought and a lot less special effects (and another director, for Joe Wright's forte seems to be more elegant, Merchant Ivory-style productions than fantasy...and I was not a fan of his action film Hanna) could have created something wonderful. As it is, what we end up with is just a horror: in equal measures boring and rushed, confused and idiotic, dull and overblown.